Our free sports programme kicks off (excuse the pun) on Sunday 25th September with Zorb Football. 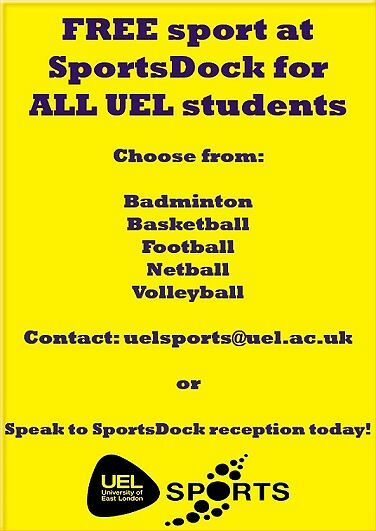 You can also take part in some Table Tennis, Wheelchair Basketball, and Badminton FOR FREE from 12:30-16:00 in SportsDock. My UELSports sessions will be starting from the week beginning 3rd of October! These sessions are completely free for students of all abilities. There’s no commitment, just turn up and have some fun playing the sport or activity of their choice. The first My UELSports Tuesday tournaments of this academic year will be Table Tennis on October 11th. These tournaments take place on a weekly basis for you to compete against other students with your classmates or friends in a variety of sports and activities. There will be prizes available for the winners each week too! So will ACE keep the trophy or will HSB recapture the title or is this year the turn of a new Hall or School to be crowned Champions?